1. In a large soup pot over medium heat, heat oil. Once hot add the onions, sprinkle with salt and saute until softened, around 5 minutes. 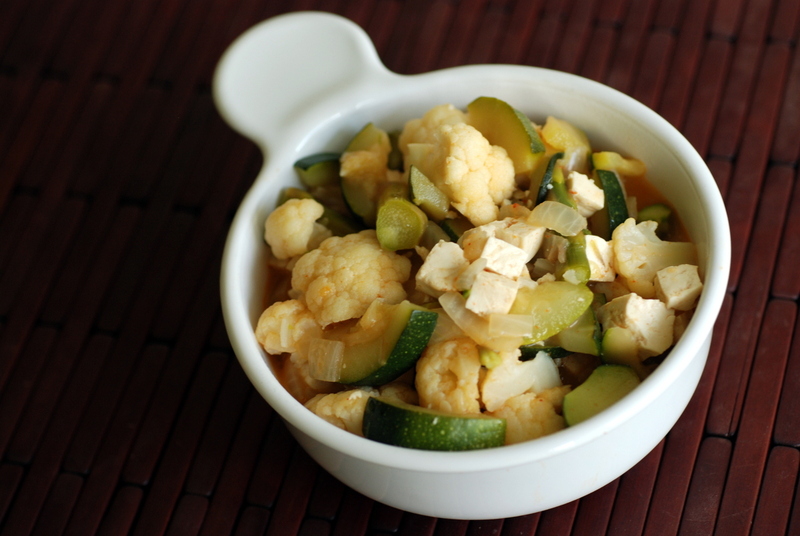 Stir in the zucchini and cook 2-3 minutes. 2. Meanwhile, stir the curry paste into a portion of the coconut milk and stir until dissolved. Deglaze the pan by adding this mixture to the pot. Stir to coat the zucchini. Add remaining coconut milk. 3. 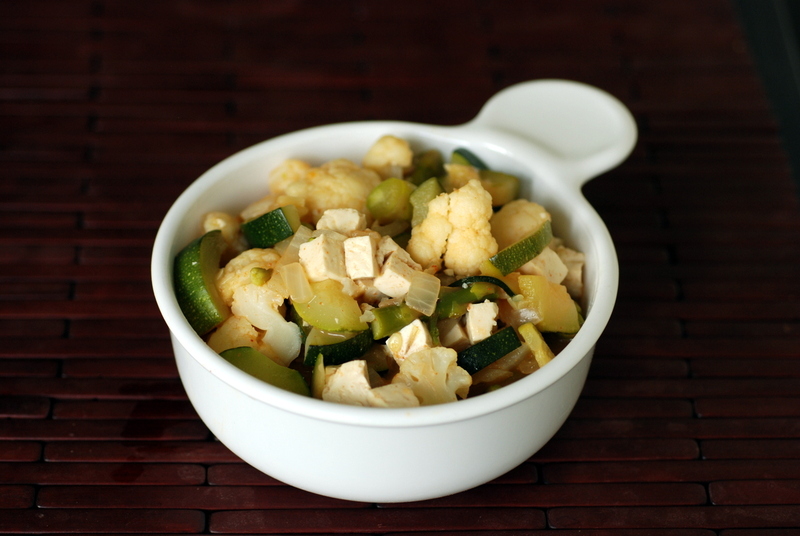 Stir in the asparagus, cauliflower and tofu. Stir to combine. Cover and bring to a boil. Allow to cook 3-5 minutes until the vegetables are crisp. 4. 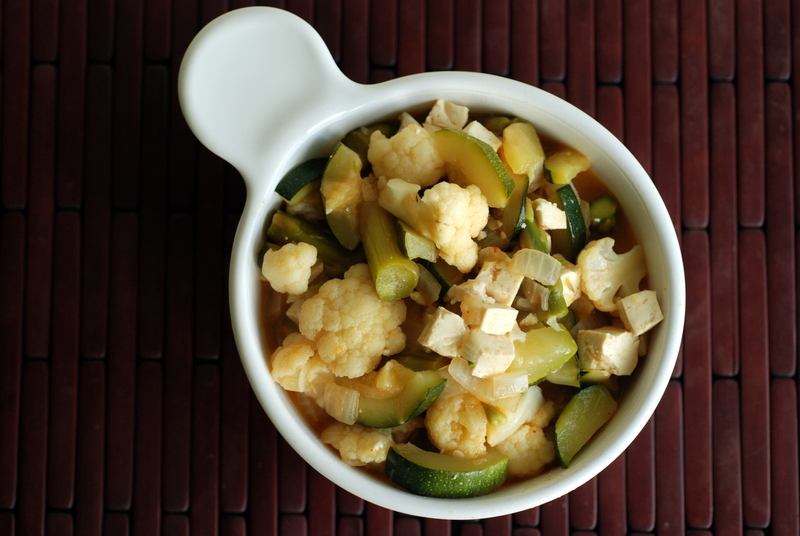 Uncover, stir in the vegetable broth and allow to simmer until the vegetables are cooked to your liking, 3-5 minutes more. Season to taste. Serve with brown rice. It must be great having Rob eat everything! None of that- I’m too manly for vegan food- stuff! I only had red Thai curry for the first time this year – I too had always thought of it as seriously spicy, and the one I had actually was seriously spicy. However, it was at rather than above my spice threshold and I really liked the flavours 🙂 I’m glad you’ve discovered it too and are having it at home no less! Mmmmmmm yummy comfort food! You know much I love my Thai foods! I always add a little extra when using Thai Kitchen curry pastes while I buy a brand at the Asian market here that blows me out of the water with heat–such a difference. 😉 This looks fabulous–so packed with good things and I love red curry. Thanks for sharing with Souper Sundays this week.